I find that life can be a little strange sometimes; how different it can look from one moment to the next, how you can go from one way of seeing things and then realise how fleeting that time is, as all of a sudden something else comes along, and change happens once again. Rearing a child is exactly this - change is the only constant. My working life currently also has it's own set of challenges too. It's very much like train tracks stretching out into the distance in parallel - not much of a metaphor, I know, but none the less all I can muster up right now. It wasn't so long ago I was exclaiming how easy it was to put Kien to sleep. A bottle, a kiss and he was waving to me as I walked out the door. He babbled or sung to himself until he was asleep. He would wake up once during the night and after a bottle would go straight back to sleep until the morning. Nap time was the same - it was like clockwork. Since his last bout of tonsillitis (when he actually slept through the night for an entire week) it has been increasingly difficult to get him down for the night. He doesn't finish his bottle and yet asks for more if I put it down. He doesn't want me to leave the room, and sits up looking for me constantly. During his night wakings it is the same as well. The night before last when it was my shift he woke up 3 times, and he did not want me to leave him. So I curled up on his floor each time waiting for him to fall asleep. Needless to say I did not manage a huge amount of sleep overnight, especially when he woke up at 5:45 in the morning wanting cuddles. He snoozed for another 15 minutes in his cot and then we were done with sleeping. I bundled him up in my arms and we curled up on the floor together. His little arms intertwined with my enveloping embrace. He chatted to me as we lay there, pointing out all the things he could identify in the semi-darkness. I'd ask for kisses and he gave them freely, sloppily. Then he went back to chatting merrily. Every cloud has a silver lining, and even though I had such an early start to the day it was also a beautiful time Kien and I shared. Kien was one day shy of 20 months old when he took his first flight. It was on a Beechcraft 1900D, and we were seated at the very back of the plane. Kien was pretty good on the flight, although he was apprehensive when boarding (and screamed at being restrained in the child safety harness). His fascination for airplanes saw us right for the take off, and he pointed out all the planes he could see on the runway. For parents who love to travel this was a pretty exciting milestone, and a test before the big trips overseas. The scenery is terrific, especially on such a lovely day. Our little aircraft's shadow in the ocean on our decent into Whangarei. Kien's Granddad Warren picked us up from the airport and endured a 20 minute drive home with a screaming child who did not want to be restrained in the carseat. At this point I realised Kien has never ever been in any other vehicle except our Honda CRV. Oh well, this was our test run after all! But when we got to their place he warmed up, and everything was fine. After a cuppa and biscuits being crumbed all over Warren and Margaret's place we were off to enjoy the sunshine. First stop was the park. Kien's favourite book at the moment is "Humpty Dumpty". Kien did have a fall that day, but not here. Wearing his Granddad's School of Engineering cap Kien definitely looks cool in his jeans and sneakers. It was a fantastic playground, and I reckon he will enjoy it even more so when he is older and able to play on all the equipment. The facilities do cater for everyone though. The eldest son of the eldest son. Margaret and Kien had their own little adventure on the beach. We had such a fabulous day with the family, and Kien was almost perfect on the flight home as he played with his spoon and raisins for pretty much the entire time. Auckland welcomed us home. I'm currently sitting at Salisbury reserve watching Kien playing independently...it is bliss. He goes through phases of being this way, whilst other times he cannot do anything without us hovering close by. He also loves watching older children playing, which can keep him entertained for ages. As it is a beautiful day there are lots of kids here, and it is lovely. So I definitely do not take these moments to myself for granted, because it can change in an instant. Last Tuesday afternoon we went on a picnic at Frances reserve. When it poured down with rain in the morning I was disappointed the weather had spoilt our plans, but it wasn't to be. The sun came out! We grabbed some delicious food and coffee from the bakery on the corner, and the kids were able to enjoy the playground. Making the most of non rainy days and being outside is really important to me, as it is an opportunity for Kien to burn off some of his exuberant energy and for me to soak up some vitamin D. As I sat on my blanket and watched Kien playing with his Grandma and Rod I was so pleased that everyone was able to make it out, and I look forward to more picnics to come. The other night Jef asked me if I knew of Paddington Bear. I did not grow up with this famous bear, and although I have heard the name I knew nothing about him. The story goes that he comes from Darkest Peru, loves marmalade sandwiches, and has an endless capacity for getting into trouble. I had a really good chuckle when Jef revealed his google image search, and compared with the pics I posted of our expedition up Mangere Mountain the resemblance is uncanny. On Sunday afternoon we went over to my friend Linda's place after returning home from our walk around Ponsonby. Jef was still in the middle of cleaning our place (and also required some quiet time) so I left him to continue as I grabbed a mango and a couple of limes from the fruit bowl and headed out the door. A quick stop to grab sushi for Kien to snack on and to fill up on petrol - which cost a whopping $130 (wow, when did it get so expensive? I'm glad I don't drive often!) and we were in Greenhithe. Kien and Flynn haven't seen each other in ages, and it took a little bit of time for him to warm up, but once he did they had a great time together. They hung out in the playroom in amongst the mountains of toys. The Thomas tracks were fun to put together, and once the battery powered train went on I'm sure they sat and watched it go around for a whole minute. Kien didn't know what to do with all those Smurfs! I had a huge collection of Smurfs once - I packed them up in a box and gave them as a gift to a guy I liked. I don't think he knew what to make of such a gift....anyway, back to the children. Flynn showed Kien his radio controlled car. He drove it around the floor and crashed it into chair legs. It made Kien giggle and laugh really hard. 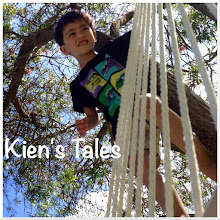 Flynn also entertained Kien in a variety of different ways. There was a fondness that the children showed toward each other, and it was so lovely for their mothers to watch it unfold. Brrrr, it's been crisp, but oh so beautiful. Winter just could not be any better than this in Auckland. The sun has been shining for days now and with it the excitement of Spring being just around the corner. It's almost sinful to be indoors on days like these. So we weren't. This was where we were on Sunday morning - up Mangere mountain. The view was varied and interesting on the way up. Kien got to try out his mountaineering skills. From here there is a magnificent view out past the flat plains toward the airport. I was quite amazed that so much of Auckland can be seen from up here, especially on such a clear day. In the middle of the below photo is the mouth into the Manukau harbour. Walking further around the mountain there is the view to Auckland city. Cows grazing lazily with a backdrop of the city. There was also a bonus of meeting up with some bulls. The bull Jef and Kien were patting in the photo may appear friendly, but in fact it charged and bunted them a few seconds later. No more patting wild animals. Although Kien is an excellent climber and a fantastic walker his shoes did not see a lot of ground action. Why should he walk anywhere when he has parents! Kien, you can do the walking thing so well! I took Kien out for brief walk after he woke from his nap. We went through Western Park, where he insisted on staying in his stroller while he watched some children playing on the seesaw. He was completely mesmerised! I will always walk down Anglesea Street on the way home if at all possible, because I love the view to the city from here.